"This isn't a sad day for baseball. Hell, this is a joyful day, the first day of the rest of our lives without the creep who scummed up Henry Aaron, hijacked the Great American Home Run and held us hostage with his sleaze and smarm"
-Jay Mariotti, writing in a column entitled "Bonds Busted: A day to celebrate"
Give us your top 10 individuals and/or teams as part of our prediction contest (we'll have a scoring system up later and our prizes but if you want to get started on your picks go ahead). Note: Bri Felnagle has been added as one of the women's options. We left her off by mistake orginally but now she is on there and "other" will not count for her. Podcast: Jason Lehmkuhl He talks about his breakthrough at the Trials and running with a heart murmur. Elite Racing to Put on Rock N Roll Marathon in San Antonio They've shown they know how to put on world class races. Especially in big cities that haven't had big marathons in the past. Kenya: Moses Kigen Runs 56:14 (Equal to a 59:20 Half Marathon) at 5900 Feet in Kenya That is an incredible time at 6000 feet. 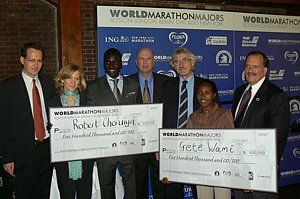 Martin Lel and Robert Cheruyiout Want To Run Olympic Marathon Kenya would be stupid to leave the London and NYC champ Lel off as well as World Marathon majors champ Cheruiyot as in our minds they are the top 2 marathoners in the world currently (sorry Haile). Because of Error With Chip Timing, State High School Title Changes Hands in Texas 2 Days After the Fact The officials should be embarrassed for not fixing the problem right away. Chips do not replace good old scoring by hand if the meet is anywhere close. Runners in Iten Are Being Accused of Impregnating Young Girls and Town Wants to Kick Some of them Out As Wejo pointed out in his highly praised recap of his trip to Kenya, tiny Iten is full of runners. On the boards: What happened to Jess Baumgartner? Remember the guy who finished 3rd at NCAAs last year out of nowhere as a junior. Great Matchup at Fukuoka Tergat vs Wanjiru The former world record holder Tergat will take on the world half marathon record holder Wanjiru in his debut, plus Japanese stars Takaoka and Fujita. From what wise old people tell us, Fukuoka was once the greatest marathon in the world. Syracuse was th last team left out on the men's side. 2nd Athlete at New England Champs Says He Got Sand Thrown in His Face The bigger question for many is whether the first athlete was targeted because he is Somali. *Sand in Face Brings Back Bad Memories for a Coach Who 15 Years Ago Had his Team Attacked by Thugs in the Woods at an XC Race It was a bad beating as athletes went to the hospital and arrests were made. Track And Field News Hails Kentucky Men's Recruiting Class as Being Nation's Best The Kentucky coach sums up the cold, hard truth about college coaching perfectly: �Recruiting is the most important thing we do, but we all know championships aren�t won on paper." *2004 Olympic Champ Mizuki Noguchi Back from Altitude Training for Matchup Vs Japanese Record Holder Yoko Shibui in Next Week's Tokyo Marathon Should be a great matchup with 08 Olympic spots on the line. The Woodlands Win Their Record 14th XC Title in Texas The accomplishments of the program are truly amazing. "I think I cannot run 3:26 (for 1500). I know I can still run 3:28 and that is plenty good enough. I don't have to prove anything by trying to run 3:25, which I know is not practically possible. But my time is in the books and you know what? I am still competing at the age of 32 and I am still beating the young guys." -Bernard Lagat indicating he will likely go for the 1500, 5000m double at the Olympic next year. This is Not a Joke: Eugene Trials Have Created a Group On How to Treat Black People at Olympic Trials The article says Trials volunteers are not supposed to make assumptions based on someone's race, yet they are teaching the volunteers about soul food and hair salons. 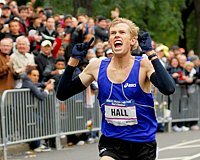 Ok.
*Chasing Kimbia Recap of NY Marathon/Olympic Trials "But perhaps most significant was the fact that three white guys crossed the finish line first." or if you didn't play see how smart Wejo is as he picked the top 3 perfectly on the LetsRun.com PreTrials Radio Podcast.